It’s right there in the tall grass ahead of me. Just about the juiciest tidbit I’ve ever seen. Nice and chubby with spiky legs and wiggly antennae. A real dream of a cricket. BOING! There’s no cricket in sight. Not even any tall grass. I guess it was just a daydream. Instead of the swamp, I’m in my tank in Room 26 of Longfellow School, and that furry guy in the cage next door is at it again. “SQUEAK-SQUEAK-SQUEAK!” I haven’t been here long, but so far, that’s all he says in his high-pitched little squeal. I’ve never seen anyone in the swamp like him. My skin feels dry, so I plop myself into the large bowl of water in my tank. The water here is a lot cleaner than it was back in the swamp where I used to live. The teacher puts in fresh water every day. It’s nice, although a little bit of muck never hurt anybody. “A little less splashing over there,” the teacher says. I pop my head up above the water and see that she’s smiling at me. “Who . . . me?” I ask. Some of the students giggle. They like to giggle. I haven’t been in school for long, but I have figured out that the big human is the teacher and the smaller humans are her students. It’s just like Granny Greenleaf teaching the little tadpoles back in the swamp, but these tads are much bigger. I have no idea why the furry guy and I are here. We don’t have a single thing in common with the humans or each other. Don’t get me wrong. While the squeaking sometimes gets under my bright green skin (with snazzy black polka dots), I’m glad to be living in Room 26 and out of Room 27. I’d rather be back in the swamp, but I was hoppy to go anywhere to get away from George. In fact, for a while all I could think about was getting away from George. George is the other frog back in Miss Loomis’s class, where I started out at Longfellow School. He was not a nice frog. To be fair, until I came along, he was the only frog in Room 27. I guess he liked it that way. But it wasn’t my idea to move to a classroom. I was content to live in the swamp. It was a paradise for frogs, offering every kind of yummy insect you can imagine! I ate crickets for breakfast, dragonflies for lunch, beetles and grasshoppers for dinner and mosquitoes as a bedtime snack. There were also lovely snails and other small crunchy creatures. Yum! There was plenty of water to keep my skin wet, and there were damp, grassy places where I could hide. I had to do that often, because there was danger, too. Beaky birds and slithery snakes. Lurking lizards and some furry foes as well. But I can swim, and I can leap, and it was always just a hop, skip and a jump to safety! Once I reached a soggy and sticky hideaway, I could daydream to my heart’s content. And I do like to daydream! Every morning, I looked up at the sky and sang a joyful song. Where we hop and leap and romp. What’s that I see over there in the thicket? Joy, oh joy, it’s a lovely cricket! Swamp, oh swamp, I sing to you! I thought that George might like my song, but no, he most definitely did not. There was nothing he liked about me. You see, George is a bullfrog, and it’s well known that bullfrogs are the bullies of the swamp. For one thing, they are BIG. They are also loud and bossy. You get a group of bullfrogs together at night, and you won’t believe the racket! They call it singing. I call it an uproar. The worst was a critter named Louie the Loudmouth. Louie was all mouth and no brain. I think he was related to George. Louie mouthed off nonstop, until one day when a long- legged crane silenced him forever. There was peace in the swamp at last. But there was no peace with George in Room 27. He was a bully who took an instant dislike to me and let me know it. George said terrible things to me, day in and day out. I won’t repeat any of it, because he said insults that tadpoles— big or small—should never have to hear! Sometimes I’d politely answer with the clear, strong call of a green frog. Ordinary frogs may croak, but green frogs like me have a special twanging sound. “Who says?” I’d repeat with a boing. Green frogs are proud of our twangs. When we go boing, every critter in the swamp knows exactly who we are. But George wasn’t impressed. He got even louder. And so it went, all day long. All that noise made Miss Loomis as jumpy as a jackrabbit. She could hardly teach because George was so loud. The problem didn’t stop at night, either. I’m not sure George ever slept, because he kept up a steady stream of RUM-RUMs all night long. There was never time to do what I like best: Float. Doze. Be. That’s when I just let my mind drift like a cloud. I always get my best ideas this way. So when Miss Loomis explained to the class that I’d be leaving Room 27 and moving to Room 26, my heart started beating like a hummingbird’s wings. I didn’t know anything about Room 26, but it had to be better than living next door to George. Anyplace would be better without George. The teacher in Room 26 is called Mrs. Brisbane, and she seems nice. She’s not a bit jumpy, like Miss Loomis was. She’s as steady as a salamander. In my short stay in Room 27, I learned to piece together some of the sounds humans in the classroom make. But it wasn’t easy with George going RUM-RUM all the time. It’s a wonder the students learned anything. I found out more about human speech over the holidays, when Miss Loomis took George and me home for the break. Of course, she couldn’t leave us near each other without George rattling off a thunderstorm of RUMs. So she put him in a room at one end of her house and put my tank in a room at the other end. I was in the room with the picture box—which I later learned is called a television. Sometimes Miss Loomis would fall asleep while watching, and the television would be on all night. That’s when I really learned to understand human talk. Words like news and pain relief. And the quiz shows were very educational. For instance, did you know that there are places called deserts that get less than ten inches of rainfall a year? I don’t think my frog friends and I will be moving to a desert any- time soon! And the capital of Spain is actually Madrid. The most fascinating fact I learned from a game show is that the longest frog leap that has been recorded is—are you ready?—33 feet, 5.5 inches! I’m going to need a lot of practice to beat that record! Of course, I don’t have that much room to leap in my tank. When I first came to Room 26—with Mrs. Brisbane’s nice voice and no George to interrupt—I was able to hear what was going on for a change. Miss Loomis carried my tank into the classroom, and the students were as excited to see me as I am when I zero in on a cricket. that belonged to the scrawny little fluff ball in the cage next to me. Someone made a strange noise—“Ribbit.” It didn’t sound like anything I’d heard back in the swamp, but everyone laughed again. 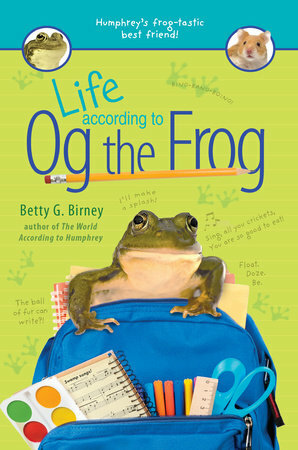 When Mrs. Brisbane said that I’d make a nice friend for Humphrey, I heard a little squeak from the furry guy next door. He must be called Humphrey! After Miss Loomis left, the students gathered around my tank for a closer look. All except one, a red-haired girl who looked as miserable as a toothless swamp beaver. The students had a lot of questions, and Mrs. Brisbane had the answers. She explained that I am an amphibian, so I am cold-blooded. She said that hamsters like Humphrey are warm- blooded. So Humphrey must be a hamster! It was like a game. I’d say, “BOING,” and everybody would laugh. A boing may mean I’m happy or sad or may be an answer to a question, but unfortunately, humans can’t understand me. When the big tads wanted to know what I eat, Mrs. Brisbane told them, “Miss Loomis said he likes insects,” which is true. Just thinking about a nice, juicy cricket makes my tongue tingle. But the students all said, “Ewwww!” and made faces. Except for Humphrey, who let out a series of three high- pitched squeaks. I’m not sure you’d even hear him in the swamp, with all the loud animals there, especially the bullfrogs. Still, his squeaks don’t sound mean like George’s rumblings. He seems harmless but slightly irritating, like a furry fly. And he’s such a fuzzy little thing, he’s no threat to me. He couldn’t even scare a slug. Mrs. Brisbane assured them that eating crickets is nor- mal for frogs—yes, ma’am! Luckily, Miss Loomis had sent a jar of crickets along with me. Life is better with a jar full of crickets—and no George. 26, the big tads all leave the classroom, but the furry fellow and I stay. BING-BANG-BOING! Without George, the quiet is a relief. I am just about to doze off when I hear that sound again. It’s something squeaky, but this time it doesn’t sound like the furry guy. I glance over at his cage, and what do you know? My tiny neighbor is running inside a great big wheel. Snakes alive! Who spins in a wheel? Nobody in the swamp does that. It isn’t nearly as bad as being around George, but sud- denly, I am a little homesick for the buzzing, humming, rus- tling, rattling, croaking, chirping and swishing sounds of the swamp. I climb into my water bowl to reflect on my day. It’s eas- ier to think when I’m damp. The screeching and squeaking sounds are a lot softer underwater. But then the bell rings, which even underwater, I can hear. The students come back, and soon Mrs. Brisbane is talk- ing about my old home. Wow! I never knew how old the trees around the swamp might be! Even older than old Granny Greenleaf! It’s odd to spend all afternoon indoors. Back in the swamp, I spent my afternoons looking for food. (Sometimes I came up short.) Of course, I don’t have to do that now. I don’t have anything to do here. It’s an easy life (but maybe a little dull). After a while, the bell rings one more time. I pop my head up and watch as the students leave again: the boy with glasses who’s always the first out the door, the loud boy, the shy girl, the giggling one. with that round thing on the wall ticking so loudly. The humans look at it to know what time it is. I guess they never thought of just looking up at the sky: the sun, the moon and the stars. You can tell what time it is in the swamp without ticking noises or loud bells. The room slowly turns dark, and I am hoppy that the furry guy is quiet. Maybe he’s dozing, too. And then, all at once, my neighbor flings open the door of his cage and scurries over to my tank. Wouldn’t you think somebody would put a lock on that door? “SQUEAK-SQUEAK-SQUEAK! SQUEAK-SQUEAK- SQUEAK-SQUEAK!” he says in a very excited voice. I think he’s trying to tell me something. Does he think I understand? Frogs and furry creatures are never friends in the swamp. Still . . . he’s a lot friendlier than George ever was. I decide to give him a glorious green frog greeting. I leap toward my neighbor and say, “Hoppy to meet you! BOING-BOING!” in my fabulous froggy way. After a while, there is only the ticking noise and the gentle song of crickets in the room.